With the costs of energy steadily rising, energy consumption is playing a more significant role than ever in the total cost of machine operation. As a result, the hydraulics industry is demanding energy efficient solutions that also meet stringent government regulations for environmental protection. Eaton’s Variable Speed Drive and Pump Systems can help you cut energy usage by up to 70% depending on the machine duty cycle. This can help significantly reduce operating costs, so your investment can quickly pay for itself. 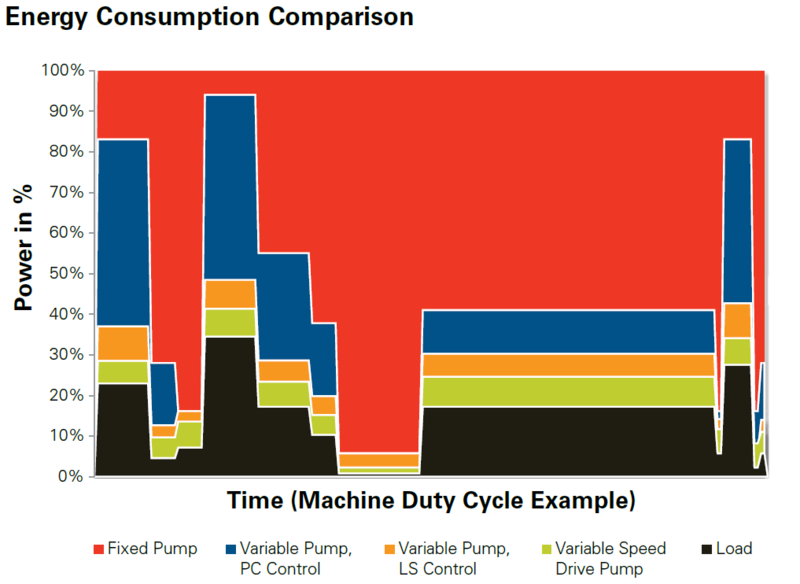 The proven performance and power density of Eaton’s pump families combined with the smart control of Eaton Variable Speed Drives enable these systems to achieve power-on-demand more efficiently than conventional constant-speed drive pump systems. Instead of operating constantly at 1500 RPM or 1800 RPM (depending on the region), Eaton’s Variable Speed Drive Pumps can be controlled to match the load requirements of the current duty cycle via intelligent control. As a result, you can eliminate energy waste. Noise reduction is another significant benefit of running your pumps at variable speeds. The electric motor and pump speed vary constantly in an Eaton Variable Speed Drive System to match the duty cycle requirement. This results in remarkable noise reduction, which helps protect operators’ hearing and meets more stringent noise regulations. With improved energy efficiency comes less heat production, so these systems can often allow you to downsize or even eliminate oil coolers. Otherwise, they can help reduce the amount of hydraulic oil you use and the size of your tanks, thereby extending the life of seals and oil. 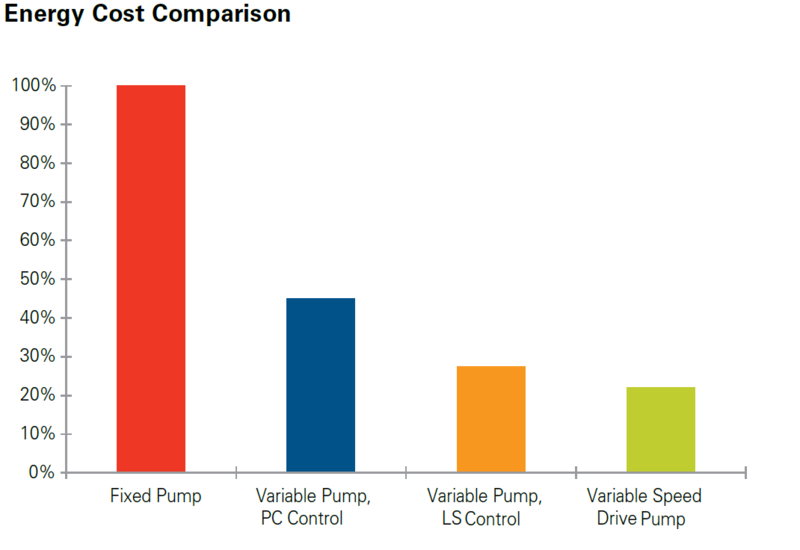 Eaton’s Variable Speed Drive Pumps open the possibility of downsizing your pumps to cut costs. Because the system can run higher than 1500 RPM or 1800 RPM, you can reduce the pump displacement requirement proportionally for the same amount of flow—shrinking the machine’s overall footprint. Backed by experienced application engineering, service, training and sales support—as well as the power of one Eaton—Eaton’s proven pump and variable speed drive products can be a powerful combination to resolve challenges in today’s demanding market. To find out how Scott Industrial can get you great pricing on Eaton’s products and systems, please e-mail us at [email protected] or call 937-233-8146. More information on our services can be viewed at www.scottindustrialsystems.com. This entry was posted in Fluid Power, Hydraulics, Industry News and tagged Eaton, Energy Efficiency, Hydraulics, Pump Solutions, Variable Speed Drive. Bookmark the permalink.